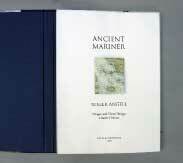 Ancient Mariner has been made as a limited edition of thirty-nine copies over the winter and spring of 2009. The essay by Roger Angell has been set in 18 pt Times New Roman, and was printed letterpress on BFK Rives by Les Ferriss in Healdsburg, California. 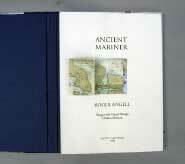 The maritime charts of Maine used in the book have been reproduced from old charts once used by Roger Angell, particularly Chart 13313, "Approaches to Blue Hill Bay." 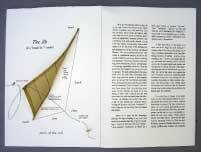 John DeMerritt, Emeryville, California, made the binding and case. The edition was designed and assembled by Charles Hobson with the assistance of Alice Shaw. The images by Charles Hobson are monotypes with pastel and have been reproduced as high resolution digital prints on an Epson 2200. 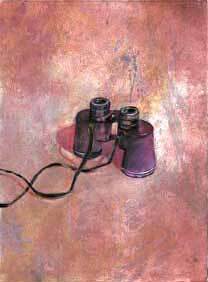 Binoculars are an essential piece of equipment on a sailboat, especially in the islanded waters of Maine. "There's a much-visited flat ledge on the western side of the anchorage at the Barred Islands which I forgot about--we were easing along with sails down, looking for a place to drop anchor--because Carol and John Henry began exclaiming over a nest of young ospreys theyÕd spotted through their binoculars on a nearby niche: bang." 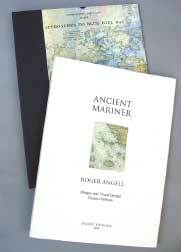 In Ancient Mariner Roger Angell considers the jargon of sailing and how sailors are often seen as a breed apart. In the book the jib can be shifted by pulling the port jib sheet to revisit some of his reflections. "Some of it must be the language, although the argot of sailing, to my ear, is not much more arcane than that of golf or cooking or opera or flytying. But say "sloop," "close-reached," "starboard," or "tiller" (as I have done here), or murmur "halyard," "jibe," "headsails," "genoa," and the rest with any air of familiarity (it's "heads'ls," I mean), and you are instantly seen as a dilettante, a poseur or a snob, a millionaire, and, almost surely, a Republican." The title page features a fold-out chart which opens to reveal "the sweet cove next to Devil's Head, on Hog." 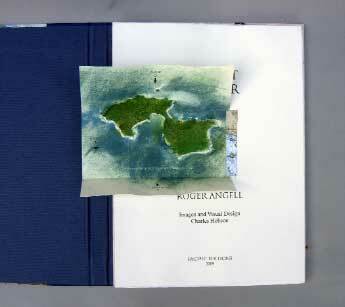 The image of the islands has been made as a monotype with pastel based on details taken from Google Earth, Version 4.2. 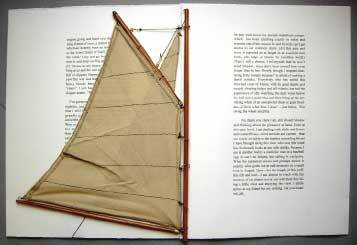 Sails from a model sailboat are sewn into the book so that in order to read the last page the reader has to jibe the mainsail. 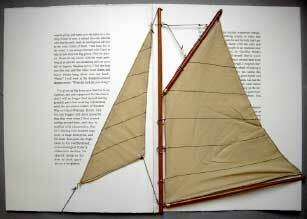 The shape of the mainsail on the sailboat Roger Angell sailed has a different profile than the model sail used in the book. In order to clarify this a footnote was added to the colophon. "* I'm glad you're moving along with the project. I know you're not doing any specific illustrations but it's been on my mind to remind you that the Herreshoff 12-1/2 we've been sailing all these years is the old gaff-rigged type. As you can see in photos, with this rig the gaff is hauled up almost flush with the mast, and the peak rises well above the mast top. The more common Marconi rig, by contrast, has a taller mast, with the peak rising in standard fashion." 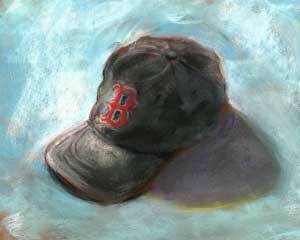 A final image, that of a weathered Red Sox cap that served Roger Angell as a saiing hat, serves as a tailpiece.